Mrs. Miner's Kindergarten Monkey Business: Communication and a Nameplate Freebie--Monkeys, of course! Communication and a Nameplate Freebie--Monkeys, of course! I just made my new nametags for the beginning of the year and thought I'd share with all of you. 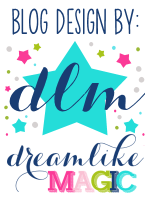 I just love these little monkeys from Scrappin Doodles! I have uploaded them as a google doc for you with two on a page if you are interested. Please click here to download them. 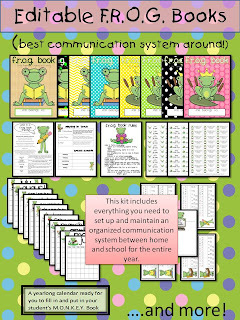 I also added new Editable Monkey and Frog Binder Kits at TpT. It has EVERYTHING that you need to start your year off right communicating with families and continuing that communication throughout the entire year. If you haven't heard of communication binders, they are a 3 ring binder that you prepare for each of your students at the beginning of the year. Of course, none of us teachers could ever go with just a plain, boring binder, could we? No, we have to choose a theme and make all of the printables that go in the binder follow the theme. Oh, wait, and the monthly calendars? Those are all monkey-themed as well. I had read about these binders when I first started teaching and kept thinking how much work (not to mention money) would need to go into these binders to get them started and what is wrong with my take-home folders anyway?? Then Stephanie (my bestie next door who always seems to know what she's doing!) moved in with her fancy little M.O.O.S.E. books and I decided to give it a go. It was one of the best decisions I have ever made as far as the home-school connection goes, not to mention building responsibility in my kindergarten students! There are no longer any excuses for lost homework or newsletters (because it is tucked neatly in the folder IN the MONKEY book). No one can say, "I didn't know that was going on" (there is a monthly calendar clearly labeled with all specials and any other dates to be known). The students actually bring their sneakers on P.E. day and return their library books on time (There is a "specials" chart that is kept in the book all year long, as well as a marked calendar). Parents return paperwork the next day. There is something exhilerating (speaking from experience as a mom of a kindergartener, too!) about opening a binder that is neatly organized versus pulling crumpled up papers out of the bottom of a bag! I feel like the organization of it allows parents to stay organized, too. There are tons of different acronyms that teachers choose to use for their binders. I, of course, use M.O.N.K.E.Y. (My Organizational Notebook Keeping Everyone informed all Yearlong). You can find my kit at my TeachersPayTeachers Store. But, I also added a F.R.O.G. binder set for all you frog lovers out there! These are great! My theme is also monkeys and Chicka Chicka Boom Boom. Thank you! Thanks for the freebie!! Love monkeys! !